There are basically two types of common modern tents – ridge and dome, both with innumerable versions. The ridge is a variant of the two-sloped portable house – it has a pole right across the middle, and the entrance is usually triangular. (The lighter versions are sometimes called “tiny dog house” in Croatia.) The dome is more popular and it comes in many varieties, housing from two to 5 or more people. It has flexible poles which cross at the tent’s highest point. The “period” tents are usually a version of the ridge tent, made from natural canvas, and the dome is commonly some sort of synthetic nylon fabric. And no – it doesn’t substract from the comfort level. It actually adds to it. One / So, you want to buy a tent? #1 Know your needs. Everything counts – your common larping terrains and how they relate to tents, your usual comfort levels, the weight you can carry by yourself etc. If in doubt, go for a tent a bit bigger than you think you might need – and always go for a lighter one with smaller bulk. Also, don’t get discouraged. Once you’ve seen one, you’ve basically seen them all.Tents are logical, even if at first they don’t seem so. Give yourself some time and try it out before you dismiss them as too complicated for regular use. #2 If you’re buying, ask around among more experienced larpers or campers. (Larpers are always the better option.) No, not all of us have to have a McKinley Matuka (really common in Croatia) – but choosing a well-loved brand may not always be wrong. A tent should last. And larpers are known to put their gear under heavy pressure. #3 Never fail to take the tent’s packed weight and bulk into consideration. Things may look splendid at the store, but more often than not you will have to carry the tent by yourself. Not all larp lots are accessible even by small cars. Modern tents run on the lighter side – I think our 3-person tent is under 4,5 kg – but you should still be careful. #4 Quality tents are not cheap. Shop around and prepare to wait a bit when looking for the right one. The co-alpha and I bought our tent – a smaller, lighter version of the aforementioned Matuka (called Flinduka) for two thirds of the price because we picked the right moment. It’s a bit harder when you shop in person – less options, especially in smaller countries – but it pays off to see the tent before you take your new home away on a romantic larping trip. #5 Note that cute looking, one layer summer tents really are cute. They are also cheaper in general. Even so, you’ll do better off with a real camping tent – a two layered dome piece. Don’t believe everything the shop attendant says – but don’t be afraid to ask if you can’t decipher the fine print on the tent’s label. Two layers is what you’re looking for if you want to stay warm and dry. Two / Using the floor of your living room for it’s true purpose. #1 Tents are not nylon-and-rope monsters. Every tiny piece of your new baby has its purpose, even the really weird looking ones. Don’t let yourself be frightened by it – it was designed by experienced people who really know what they’re doing (and have been doing it for quite a while now.) It just takes a bit of practice. Show your tent a little patience and love and you will get warm, dry and comfortable nights in return. #2 When buying, add an extra “person” into the equation. Of all the info the co-alpha and I could gather before buying our first tent, this was the most important one. After all, you need to fit all the extra people (your characters and their gear) into the tent and still have enough sleeping floor. One extra person per tent should be enough. 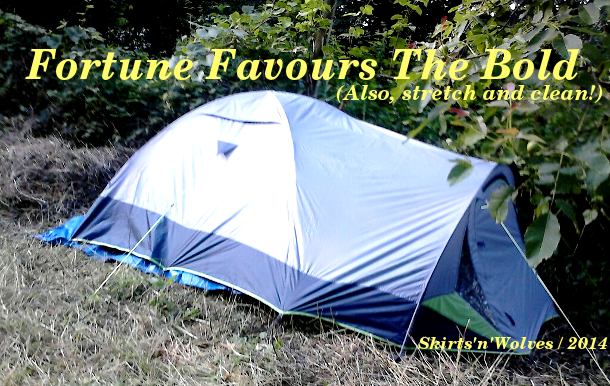 #4 Know what the erect tent looks like before you leave the house – it’ll come in handy. Before you take it out into the field with you, unpack it and unfold it on the floor at home. Inspect all the guy lines and loops and zippers and windows and when the time comes to use it, it’ll probably be easier. Seeing how many door openings the tent actually has is totally different than trying to figure it out from the drawings and schemes, and you won’t have to guess at the camp site. #5 The only rule of tent is that you can never pack it back the same way it came from the store. And it’s not a problem. You will sometimes – with time – find out that you’ve packed it even tighter. The co-alpha and I are still in awe as how well we occasionally pack it into it’s (really tiny!) carrying bag. Three / Which way does the wind blow and other issues of placement. #1 A single person can erect a nylon tent – but it’s better with two (or more). Experienced or not, you’ll be better off if you have someone to help you bring the tent up, especially if it’s already dark and/or raining! (Quite common.) Two people can stretch the layers better – if standing at the diagonal opposite sides – and it’ll definitely be quicker and easier on everyone. #2 Be careful with the ground level – and the sun/shade ratio on the site. It doesn’t just means picking up the remains of shrubs and branches which could harm your tent floor (or tarp underneath – or your back while you sleep), but also to predict what will happen at the lot in case of heavy rain. Face your doors and your sleeping feet downhill (and in the direction opposite from the dominant wind on the spot) and you should be fine. Whatever you do, never pick a terrain’s low point. You don’t want to wake up only to find out you’ve turned into a frog in a pond overnight. #3 Use your pegs and guy lines the way they were intended – to stretch your tent’s top layer as far as possible. Try telling a more experienced larper that maybe it won’t rain tonight and let me know how hard they laugh in your face. No one has to expect the Spanish inq-err, rain, for it to come down hard on the camp. The harder you stretch the top layer, the better water will slide down from it. Leave enough room around the lot to stretch the tent properly. And if case everyone forgot to mention it to you – the guy lines should follow the seams they come out in as straight a line as possible. Yeah, it looks awkward the first time around – the ropes springing out in almost every direction imaginable – but you’ll see what I’m getting at as the fabric stretches even more evenly, one peg at a time. #5 Leave the mud, ticks and mosquitoes out – not necessarily in that order. Be very, very quick when entering and exiting the sleeping area if you don’t want to wake up covered in ticks and mosquito bites. Strange as it may sound, omnipresent mud is usually the least of our worries. #1 If you can dry the tent on site in any way possible, do it. You’ll thank me later. Bring an extra-long piece of rope and find a spot for it at the beginning of the weekend. When you wake up on the last day – or after the game is over – pack your stuff and hang the tent to dry. If it’s raining or you’re in a hurry, pack it as loosely as possible for the trip and leave it to dry as soon as you get home. #2 Clean pegs are happy pegs. Be sure all of your pegs are accounted for – and clean the mud and dirt off them with a tissue before packing them. Happy pegs make for a happy tent, and we know who benefits the most from happy tents – happy larpers! #3 Repeat the only rule of tent – you can only dream of packing it back together the way it was. And it’s really not a problem. After all, if you’re taking it home wet, you don’t want to pack it anyway – just fold it as big as possible and take care of it as soon as you get home. And if nothing really works, you can always get a bigger bag. #4 Cleaning the tent when you get home can never be stressed enough. Stretching it out (if you’re lucky, you’ll have enough space to do it while it hangs, if not, go back to the living room floor) and washing it carefully with a damp cloth is the best you can do to take care of it. (Just remember to pack it back dry afterwards.) And try not to freak out about the amount of ticks you pick down from the mesh parts of the tent – imagine all of those which never even made it that far! #5 Tents and washing machines don’t work well together. Repeat after me – if you want to keep your tent working for a while, never ever ever ever put it in a washing machine. I wouldn’t even think of it were it not for a friend’s washing machine adventure – and if he’d thought of it, anyone can. Just… don’t. Save yourself the money needed to buy a new tent by avoiding washing machines. At all cost. Five / The little extra zing! #1 Get a tarp – and don’t be afraid to use it. Tarps are cheap. Tents are not. Your tent is the most vulnerable at two points – the canvas seams and its floor. A tarp can be placed under the floor, before you erect the tent, to protect it from the branches and other sharp, hostile pieces on the ground. A tarp can also be used when the tent’s older, to keep the inside space as dry as possible, especially if the seams are not as sturdy as they used to be. Spread it across the tent or hang it over it if you have enough trees. Get a tarp. Come to it – get two. #2 Get a friend or a pack member to help you with the tent – at least the first time. I have a feeling I’ve already said this… probably because it really, really helps, not just in terms of speed, but also in generally making erecting the tent that less stressful. #3 Whatever you do, stretch the tent’s layers as much as you can and don’t skip post-camp tent care. If there’s anything I’d like you to learn from this post, it’s those two things. Everything else you can fix on the way – but not rain in the sleeping area and letting yourself ruin your investment the first time you come home from the weekend larp. Stretch it. Clean it. You’ll be okay. #4 Never overestimate your comfort. Just because you have an awesome modern tent, doesn’t mean you should forgo your sleeping warmth. (Three pairs of socks is my current layering of choice.) No tent is perfect – only when it comes to ticks. (Which, for some folks, is more than enough, thank you very much.) Bring a sleeping mat and a good sleeping bag, too – or a cheap fleece blanket, if you can’t afford it. Good luck with your tent adventure! Down with ticks. Stretch and clean. Five by Five is a regular feature on Skirts ‘n’ Wolves, which runs on the first Monday of (almost) every month. I’m a huge lover of all sorts of lists, and larp-related ones fit right in. Come to think of it – got a great larp list idea? I’d love to hear about it! Drop a comment or an e-mail.